Physicists have confirmed theoretical predictions that high-energy neutrinos cannot pass through the Earth. The above-ground part of the IceCube Neutrino Observatory in Antarctica. 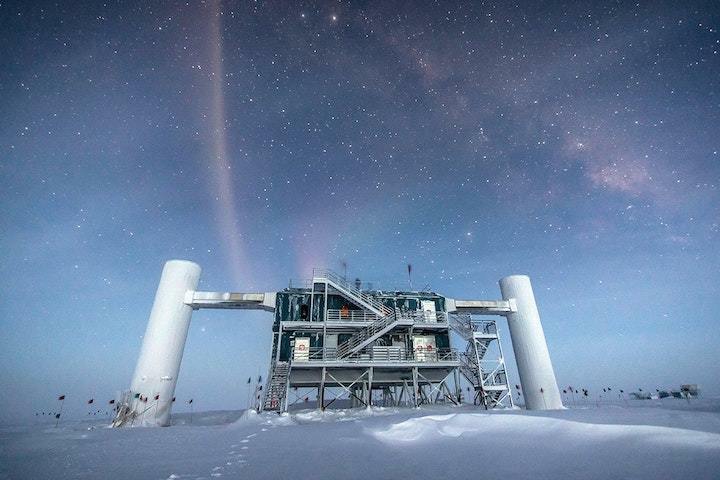 Using a gigantic particle detector buried deep in ice near the South Pole, an international team of researchers has measured how the Earth absorbs very high-energy neutrinos. The results, published in Nature, confirm theoretical predictions that the planet will stop these highly energetic particles dead in their tracks. Neutrinos are incredibly tiny particles that usually interact only weakly with matter. Although the universe is so swamped with neutrinos that around 100 million of them stream through your body every second, it is relatively rare that they hit anything. This makes them hard to detect. The IceCube Neutrino Observatory watches for these rare collisions using a kilometre-a-side cube composed of thousands of sensors embedded deep within the Antarctic ice. The sensors look out for flashes of blue light given off by charged particles that are created when incoming neutrinos interact with the ice. Tracking the flashes of light allows scientists to trace back the direction the neutrino came from and work out how fast was moving. The Standard Model of particle physics, which sums up our current best knowledge of how the universe works at the subatomic level, predicts that neutrinos will become less aloof at higher energies. Until now, however, physicists have been unable to check this prediction against experiments, as most other neutrino detectors only measure the lower-energy neutrinos emitted by the Sun or particle accelerators. IceCube, however, can observe extremely high-energy neutrinos which are produced when fast-moving cosmic rays produced in space interact with atoms in Earth’s atmosphere. By studying more than 10,000 such neutrinos observed in 2010 and 2011, the researchers were able to confirm that very few of them were coming from paths that had travelled through most of the Earth. This led them to the conclusion that those high-energy neutrinos must have been absorbed during their passage through the planet. Neutrinos are abundant subatomic particles that are famous for passing through anything and everything, only very rarely interacting with matter. About 100 trillion neutrinos pass through your body every second. Now, scientists have demonstrated that the Earth stops energetic neutrinos—they do not go through everything. These high-energy neutrino interactions were seen by the IceCube detector, an array of 5,160 basketball-sized optical sensors deeply encased within a cubic kilometer of very clear Antarctic ice near the South Pole. IceCube’s sensors do not directly observe neutrinos, but instead measure flashes of blue light, known as Cherenkov radiation, emitted by muons and other fast-moving charged particles, which are created when neutrinos interact with the ice, and by the charged particles produced when the muons interact as they move through the ice. By measuring the light patterns from these interactions in or near the detector array, IceCube can estimate the neutrinos’ directions and energies. The study, published in the Nov. 22 issue of the journal Nature, was led by researchers at the Department of Energy’s Lawrence Berkeley National Laboratory (Berkeley Lab) and UC Berkeley. Sandra Miarecki, who performed much of the data analysis while working toward her PhD as an IceCube researcher at Berkeley Lab and UC Berkeley, said, “It’s a multidisciplinary idea.” The analysis required input from geologists who have created models of the Earth’s interior from seismic studies. Physicists have used these models to help predict how neutrinos are absorbed in the Earth. In a previous career, Sandra Miarecki flew high above the Earth’s surface. During a 20-year career in the U.S. Air Force that included time as a test pilot, she flew aircraft including the B-52, F-16, MiG-15, helicopters, and even the Goodyear Blimp. The study’s results are based on one year of data from about 10,800 neutrino-related interactions, stemming from a natural supply of very energetic neutrinos from space that go through a thick and dense absorber: the Earth. The energy of the neutrinos was critical to the study, as higher energy neutrinos are more likely to interact with matter and be absorbed by the Earth. “Understanding how neutrinos interact is key to the operation of IceCube,” explained Francis Halzen, principal investigator for the IceCube Neutrino Observatory and a University of Wisconsin–Madison professor of physics. Precision measurements at the HERA accelerator in Hamburg, Germany, allow us to compute the neutrino cross section with great accuracy within the Standard Model—which would apply to IceCube neutrinos of much higher energies if the Standard Model is valid at these energies. “We were of course hoping for some new physics to appear, but we unfortunately find that the Standard Model, as usual, withstands the test,” added Halzen. This study provides the first cross-section measurements for a neutrino energy range that is up to 1,000 times higher than previous measurements at particle accelerators. Most of the neutrinos selected for this study were more than a million times more energetic than the neutrinos produced by more familiar sources, like the sun or nuclear power plants. Researchers took care to ensure that the measurements were not distorted by detector problems or other uncertainties. In addition to providing the first measurement of the Earth’s absorption of neutrinos, the analysis shows that IceCube’s scientific reach is extending beyond its core focus on particle physics discoveries and the emerging field of neutrino astronomy into the fields of planetary science and nuclear physics. This analysis will also interest geophysicists who would like to use neutrinos to image the Earth’s interior, although this will require more data than was used in the current study. The neutrinos used in this analysis were mostly produced when hydrogen or heavier nuclei from high-energy cosmic rays, created outside the solar system, interacted with nitrogen or oxygen nuclei in the Earth’s atmosphere. This creates a cascade of particles, including several types of subatomic particles that decay, producing neutrinos. These particles rain down on the Earth’s surface from all directions. The analysis also included a small number of astrophysical neutrinos, which are produced outside of the Earth’s atmosphere, from cosmic accelerators unidentified to date, perhaps associated with supermassive black holes. The neutrino-interaction events that were selected for the study have energies of at least one trillion electron volts, or a teraelectronvolt (TeV), roughly the kinetic energy of a flying mosquito. At this energy, the Earth’s absorption of neutrinos is relatively small, and the lowest energy neutrinos in the study largely served as an absorption-free baseline. The analysis was sensitive to absorption in the energy range from 6.3 TeV to 980 TeV, limited at the high-energy end by a shortage of sufficiently energetic neutrinos. At these energies, each individual proton or neutron in a nucleus acts independently, so the absorption depends on the number of protons or neutrons that each neutrino encounters. The Earth’s core is particularly dense, so absorption is largest there. By comparison, the most energetic neutrinos that have been studied at human-built particle accelerators were at energies below 0.4 TeV. Researchers have used these accelerators to aim beams containing an enormous number of these lower energy neutrinos at massive detectors, but only a very tiny fraction yield interactions. IceCube researchers used data collected from May 2010 to May 2011, from a partial array of 79 “strings,” each containing 60 sensors embedded more than a mile deep in the ice. Gary Binder, a UC Berkeley graduate student affiliated with Berkeley Lab’s Nuclear Science Division, developed the software that was used to fit IceCube’s data to a model describing how neutrinos propagate through the Earth. From this, the software determined the cross-section that best fit the data. University of Wisconsin – Madison student Chris Weaver developed the code for selecting the detection events that Miarecki used. Simulations to support the analysis have been conducted using supercomputers at the University of Wisconsin–Madison and at Berkeley Lab’s National Energy Research Scientific Computing Center (NERSC). Physicists now hope to repeat the study using an expanded, multiyear analysis of data from the full 86-string IceCube array, which was completed in December 2010, and to look at higher ranges of neutrino energies for any hints of new physics beyond the Standard Model. IceCube has already detected multiple ultra-high-energy neutrinos, in the range of petaelectronvolts (PeV), which have a 1,000-times-higher energy than those detected in the TeV range. A longer term goal is to build a larger detector, which would enable scientists to study neutrinos of even higher energies. The proposed IceCube-Gen2 would be 10 times larger than IceCube. Its larger size would enable the detector to collect more data from neutrinos at very high energies. Some scientists are looking to build an even larger detector, 100 cubic kilometers or more, using a new approach that searches for pulses of radio waves produced when very high energy neutrinos interact in the ice. Measurements of neutrino absorption by a radio-based detector could be used to search for new phenomena that go well beyond the physics accounted for in the Standard Model and could scrutinize the structure of atomic nuclei in greater detail than those of other experiments. Berkeley Lab’s National Energy Research Scientific Computing Center is a DOE Office of Science User Facility. The work was supported by the U.S. National Science Foundation-Office of Polar Programs, U.S. National Science Foundation-Physics Division, University of Wisconsin Alumni Research Foundation, Grid Laboratory of Wisconsin (GLOW) grid infrastructure at the University of Wisconsin–Madison, Open Science Grid (OSG) grid infrastructure, National Energy Research Scientific Computing Center, Louisiana Optical Network Initiative (LONI) grid computing resources, U.S. Department of Energy Office of Nuclear Physics, and United States Air Force Academy; Natural Sciences and Engineering Research Council of Canada, WestGrid and Compute/Calcul Canada; Swedish Research Council, Swedish Polar Research Secretariat, Swedish National Infrastructure for Computing (SNIC), and Knut and Alice Wallenberg Foundation, Sweden; German Ministry for Education and Research (BMBF), Deutsche Forschungsgemeinschaft (DFG), Helmholtz Alliance for Astroparticle Physics (HAP), Initiative and Networking Fund of the Helmholtz Association, Germany; Fund for Scientific Research (FNRS-FWO), FWO Odysseus programme, Flanders Institute to encourage scientific and technological research in industry (IWT), Belgian Federal Science Policy Office (Belspo); Marsden Fund, New Zealand; Australian Research Council; Japan Society for Promotion of Science (JSPS); the Swiss National Science Foundation (SNSF), Switzerland; National Research Foundation of Korea (NRF); Villum Fonden, Danish National Research Foundation (DNRF), Denmark. The IceCube Neutrino Observatory was built under a National Science Foundation (NSF) Major Research Equipment and Facilities Construction grant, with assistance from partner funding agencies around the world. The NSF Office of Polar Programs and NSF Physics Division support the project with a Maintenance and Operations (M&O) grant. The University of Wisconsin–Madison is the lead institution for the IceCube Collaboration, coordinating data-taking and M&O activities.